Sorry I’ve bee away so much folks, working full time really eats into your time to be pain in elected official’s backsides. We’re back, and we haven’t given up the fight. I hope you’ll join us for what I hope is an enjoyable and informative next few months. Why do people serve in public office? I imagine for some it’s an ego thing, but for most, I hope, it’s a desire to change things for the better. Besides, “Maintain the status quo” probably isn’t a good campaign slogan. I keep asking myself why people serve because I have absolutely no idea why several of our school board members are serving. One appears to be of the impression that it’s his job to simply rubber stamp whatever the administration puts in front of him, because “they’re the professionals”. I’m sorry, Dr Otaigbe, but you were not elected to do nothing. I thank you for your years of service and wish you well, but if you intend to simply rubber stamp whatever the administration puts in front of you until November, as you have most of your career, then do us all favor and step down. From Math Investigations, which was sold to the school board on omissions, distortions, factual misrepresentations and disregard for the law, to the pool at the 12th high school and elimination of the Ferlazzo neighborhood school, which were carefully kept secrets and only disclosed when citizen activists began asking questions and exposed their existence, this school division has become monster. The school division has never been held to account for any of this, because there aren’t enough school board members willing to hold them accountable. Your job, school board members, is to stand up to school division to ask questions and challenge their assumptions, to look beyond the materials they give you and do your own research, and to hold them accountable when they lie or omit facts that might make them look bad. You see, the school division has proven time and time again that complete, unvarnished honesty isn’t a virtue they posses. Look at test scores. For years we’ve heard that our test scores are just peachy keen, better than state and national averages. What we haven’t been told is that our scores are consistently among the lowest in the regions, in every group in almost every subject. Study after study has shown that class sizes matter; that students do better in smaller classes, yet we have no goal to aim for and no plan for getting there. Were it not for the BOCS, class sizes wouldn’t be coming down at all this year, and teachers wouldn’t be getting a step increase. The majority of you elected school board members have put no effort into reducing class sizes or trimming unnecessary expenditures from the budget, beyond ridiculing and denigrating those who have. If you can’t be bothered to look for yourself, then why are you on that board, unless you think that buying awards is more important than hiring an instructor for visually impaired children? I started to speak out against what I saw as a poor instructional program forced on my children when my oldest was in 1st grade. My youngest is 2 years behind him. He and his brother will graduate having spent their entire academic careers in schools and classrooms that were jammed to bursting. They will never know what it is like to sit in a classroom with one teacher and 25 or fewer students. That’s pathetic. That’s 14 years, and we couldn’t get our act together. Pathetic! Fourteen years is too long to be an accident; to be a bubble. Fourteen years of overcrowded schools and classrooms is the result of elected representatives who are too lazy or ignorant to look beyond the briefing material provided to them by the administration, and administration officials who bank on that lazy ignorance. The tyranny of PWCS is flourishing well, fed by the willful ignorance of our elected officials. Sometimes smart people do really stupid things. Sometimes smart people make really stupid decisions. Sometimes smart people sit by and do or say nothing when other people do stupid things. I’m getting very tired of the stupid from PWCS. For years PWCS has held budget work sessions after school board meetings. These so called work session always run into the wee hours of the morning. Everyone in attendance giggles and snickers at how late it is and how they hope they won’t have an accident on the way home. Some even joke that they might as well sleep in their offices since they’ll have to turn around and come back in just a couple of hours. This is stupid. Idiotically stupid. People can’t think straight when they’re tired. They don’t pay as close attention to details. They make silly mistakes they wouldn’t otherwise make. That’s why there are laws about truck drivers and pilots having to rest after a set number of hours at work. Sleep deprivation is considered a form of torture by some. It is high time the school board recognize that these late night budget work sessions are doing a disservice to the citizens of this community. We elected each of you to serve us and represent our interests. You can’t do that effectively at 1:00 in the morning. Not after a full day of work, a multi-hour closed session, and a multi-hour public board meeting. We citizens deserve better than this. We’ve deserved it for years. PWCS clearly isn’t going to stop the late night sessions because it benefits them when the folks tasked with oversight are numbed by sleep deprivation. It benefits them for you to be too tired to ask questions, challenge their statements, or even follow the conversation. A school board that it too exhausted to challenge them is exactly what they want. I’m asking our school board members to let last night be the last of the late night sessions. Hold the budget work sessions on the weekend. Hold them on weeknights when there isn’t a public school board meeting. If you won’t do ti for yourselves, do it for your citizens, because we deserve better. I hear from teachers all the time about how few funds there are in their schools. While PWCS doesn’t like us to talk about it, many schools continue to ration copy paper. Toner for printers is increasingly difficult to attain. Those of us with children in the school system have all seen how overcrowded our classrooms are. Lately we’ve been hearing that the school system as we know it may cease to exist if the 1.3% tax increase is approved. Everything is on the chopping block; from full-day kindergarten and specialty programs to middle school sports and extra-curricular activities. This is a two sided, legal size, color flyer, printed on high quality glossy paper. Not the cheap-o cool paper you can buy at Walmart for a few dollars. Not black and white. Not even letter size. Nope. Legal sized. Glossy paper. Color copy. Two sided. Given to every child in our school system to take home to their parents. What was so important that PWCS had to go to the time and expense to prepare, review, print, and distribute this to every single one of the 86,000 plus students enrolled in our school system? The evil BOCS has threatened to only increase taxes and the school division’s budget by 1.3% next year and the increase isn’t enough. PWCS wants more. Lots and lots more, because they’ve squeezed every penny dry and there isn’t anything left to squeeze out. 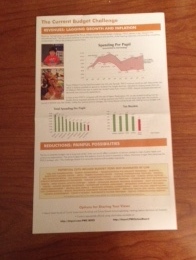 Except they were able to find the money to proceed and distribute this flyer. An email would have been sufficient. That’s all PWCS has sent in the past. 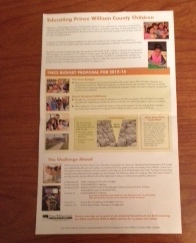 This year, despite the financials hardships under which the school division is operating, a legal sized, glossy, two-sided, color flyer was mission critical. If the message in this flyer was so vital that PWCS was willing to spend its scare resources producing it, then I question their ability to accurately gauge critical needs . If anyone in PWCS is wondering why their list of strategic programs and critical unmet needs has been scoffed at by the population in general, they need look no further than this flyer. Here’s a link to the fact sheet distributed to our students at taxpayer expense by our impoverished school system. Has PWC Underfunded Our Schools? Over that pst several weeks we’ve been inundated with complaints about PWC and the evil BOCS underfunding schools. The BOCS has been excoriated for cutting education and not caring about our children. Too bad those statements have nothing to substantiate them. As always, it starts with charts – see here debt service. Pull it up and look at it, because I’m going to reference it. For folks who question sources, the revenue numbers come for the PWCS budget for each school year. The enrollment numbers come from the VA Dept. of Ed’s report on September 30th enrollment. For the most part, PWCS is funded by money received from three sources, local taxpayers through the county, state taxpayers through the state, and federal taxpayers through the federal government. Money received from the county taxpayers is used for debt service and general education. It accounts for about 50% of the total PWCS receives each year. Money received from the state taxpayers is used for special programs and general education. It accounts for about 46% of the total PWCS receives each year. All money received from the federal government is restricted. It can only be used for specific programs, generally programs designed to help children with special needs and economically disadvantaged students. General education students who are not special needs or economically disadvantaged do not receive a single penny from the federal government. Money from the federal taxpayers accounts for about 3% of the total PWCS receives each year. Since 2010, county funds for PWC public schools have increased 18%. Since 2010, state funds for PWC public schools have increased 30%. Since 2010, federal funds for PWC public schools have decreased 20 – 25%; 57% if you include ARRA funding. Those cuts have primarily affected programs for special ed students. The net increase in funding since 2010 for PWC public schools, from these three sources, has been about 17%. Enrollment in PWCS has increased about 13%. That’s a 17% increase in funding for a 13% increase in enrollment. State and county funding alone has increased 24% since 2010. That’s a 24% increase in funding, for a 13% increase in enrollment. Inflation since 2010 has been about 9%. Inflation plus enrollment increases total about 22%, so the state and county funds for education have kept up with inflation and with student enrollment growth. I have to admit that this shocked me. If state and local dollars provided for our schools have exceeded enrollment and inflation increases by about 2%, why have class sizes increased so much? Why are our schools struggling to have enough paper for students? Why haven’t our teachers received the salary increases they deserve? Debt is part of the reason. Since 2010 PWCS’ debt service costs have increased 27%; from $799 per pupil to $900 per pupil. Debt service has increased to about 8.7% of the total PWCS budget this school year, from about 8% in 2010. PWCS wants to issue $100 million in debt for construction projects this year. That will cost us about $10 million more in debt service costs next year – more than a 10% increase in debt service costs in one year. For those of you think debt is free and doesn’t matter, this is why it matters. A $10 million increase in debt service costs means close to 20% of our local tax dollars will go towards paying off our debt instead of hiring teachers or supplying our classrooms. Cuts in federal funding for special ed are another part of the reason. Special ed students are some of our most at risk, and federal funding for programs the federal government requires have been cut by more than 25% since 2010. Neither of these two, increases in debt service costs and decreases in federal funding for federal special ed programs, explain why our schools are struggling to make ends meet. While there certainly are funding issues, what these numbers show is that we don’t have as much of a funding issue at the state and local level, as we have a spending issue at the school division level. UPDATE: As was pointed out in the comments on Facebook, non-economical disadvantaged students at Title-1 schools benefit from the additional Title-1 funds because their class sizes are smaller and the school can provide programs other schools can’t. So I’d like to clarify my comment that general education students who are not economically disadvantaged don’t receive a single penny from the federal government. General education students who are not economically disadvantaged and do not attend a Title-1 school do not receive a single penny from the federal government.